I recently posted about additions to the COC’s Ensemble Studio and briefly alluded to the company’s new programme for young orchestral musicians. Three student musicians will be mentored by members of the orchestra and will attend orchestra rehearsals of the company’s spring season productions. 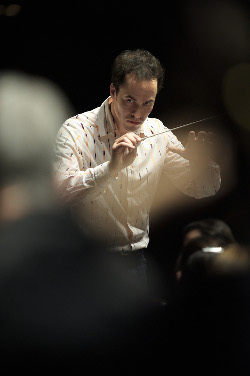 The new Orchestra Academy project will be led by Music Director Johannes Debus. Two of the students are currently studying at the Glenn Gould School. Cellist Ashton Lim will be mentored by COC assistant principal cellist Paul Widnerand oboist Alessandro Rauli will be mentored by COC principal oboist Mark Rogers and COC oboist Lesley Young. The third student is from the UofT’s Faculty of Music; violinist Rebecca MacLeod will be mentored by COC violinist Dominique Laplante. It sounds like a great opportunity to introduce young orchestral musicians to the world of opera and one hopes it will be repeated for future rehearsal cycles.